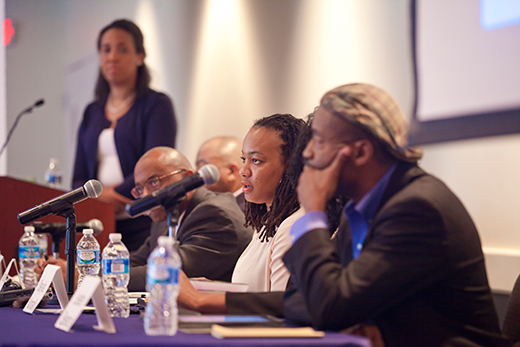 A public discussion of "Race, Policing and Social Justice from Ferguson to Baltimore and Beyond" drew a near-capacity crowd to Emory's Winship Ballroom last week to hear scholars from around the eastern United States speak about the social, political and policy implications of the Black Lives Matter movement. 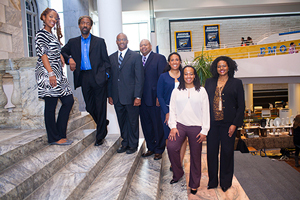 Touted as a critical biennial review of events that have fueled national debate about racial profiling and the significance of race in American society, the special program was hosted by Emory's James Weldon Johnson Institute for the Study on Race and Difference. Gillespie led the panel in a wide-ranging discussion of topics that included racial profiling, discriminatory and punitive policing practices, political participation, the politics of respectability, and a recent rise in black student activism — including student engagement at Emory. "We do this to honor the memories of regular people who became household names as a result of situations in which they found themselves," Gillespie told the crowd. "People like Oscar Grant, Michael Brown, Eric Garner, Tamir Rice, Sandra Bland, Malissa Williams, Timothy Russell, Laquan McDonald… and sadly the list goes on and on and on," she said. "They've been killed by police, in some instances people have actually been assaulted by police officers, and they've been harassed by police because they fit a certain racial profile." "Why does this happen?" she asked. "How do we put the events of the last two years into context knowing that this started well before 2013?" Gillespie suggested that listening to a panel of social scientists and scholar activists who've spent years studying the social, political and economic implications of race, politics and policing in the U.S. was a good place to start in a search for deeper understanding. What is Black Lives Matter? A movement? An organization? A moment? Franklin: There is a Black Lives Matter organization, which has 26 chapters around the country. And then there is the Black Lives Matter movement, which includes a broad array of groups… It's a movement that is moving in the direction of a transformative movement. Take a look at some of the things that have happened in the age of Black Lives Matter, just in the past two years. The Death and Custody Reporting Act of 2013 was (introduced) in Congress. Thirty-four states were considering body cameras (for police). Fourteen states have considered new anti-bias training for police. Have black lives ever mattered? Under what conditions do they matter? Nunnally: Black lives have mattered. We know when black lives have mattered. Black lives have mattered in the institution of slavery — that was when black lives were commodified. The thing is, once black people move beyond the commodification of their bodies, how can they now be perceived as human beings and not shut down? This has been the perennial struggle, for black people — to assert their humanity in a way that they are viewed as being equitable and in a way that they do not have to convince people that they should be viewed as equitable. Does research show whether blacks and non-blacks are becoming more or less aware about issues relating to policing and racial injustice? Lyle: We know from national surveys that over the last couple of years that both blacks and whites have expressed greater dissatisfaction with the status of black rights, greater dissatisfaction over the way blacks are treated by society. So it appears that the efforts of recent social movements like Black Lives Matter have had some effect on attitudes. People are far more critical of black treatment in society. What is the role of the white ally in addressing racial injustice in policing? Spence: Black people aren't fighting for black people. They are fighting to make these spaces more humane. To that extent, you don't want allies who you can tell what to do and they just have to listen to you because they're not black and don't have your experience. What you want are accomplices. You want people who, maybe they can't organize with you in a specific organization… but you want people who can take a stake, make a stand, defend themselves and then who can organize with you. In the last few months, we've seen a rise in campus activism. What advice would you give students as they formulate their requests of the administration? Franklin: Something that's actually harder than it seems is to find a way to give everyone a role. In many respects that's what the die-ins did. They gave everyone, at least for a moment, a chance to do something. Nunnally: Have a list of demands and a rationale. In many instances, when you are at the table and having this conversation, people want to know how is it that they can address whatever issue that you have. Spence: Black students on college campuses, like black people in the United States, have often served as the nation's moral voice. Black students have often served as the university's moral voice. There is a tendency when black students try to get involved in spaces like this to think they are fighting for something that's about them. It's not about them. It's about the university and the institutions. They are fighting to make the university a better place.